Junior Jester Sophia Muratsuchi of Southern California presents the first copy of the bilingual English/Japanese “Jester” book to First Lady Akie Abe. 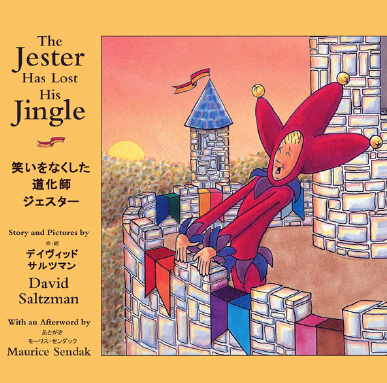 TOKYO — First Lady Akie Abe happily received the first copy of the just-released bilingual English/Japanese edition of “The Jester Has Lost His Jingle/Warai wo Nakushita Dokeshi Jester,” a classic American children’s book for 24 years. Abe also joined in the presentation of 5,000 copies of the new edition to the Japanese Red Cross Society on Thursday. 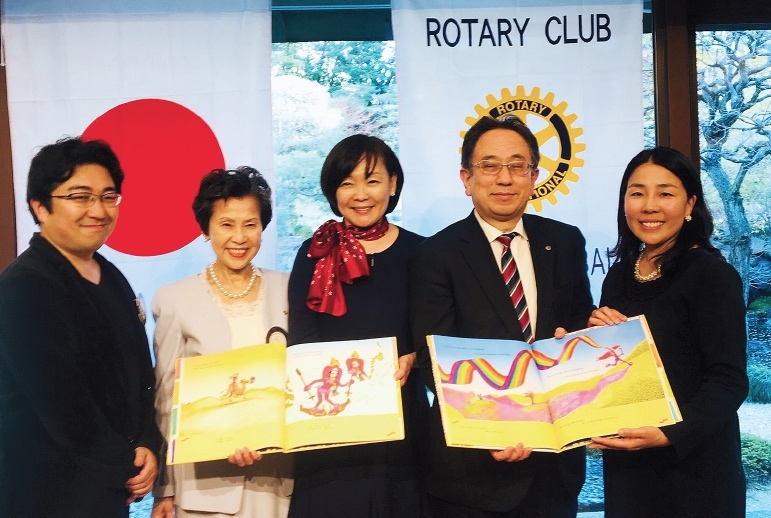 The charity will give the picture book to young patients and newborn babies cared for in Japanese Red Cross Society hospitals throughout the country. South Bay “Junior Jester” Sophia Muratsuchi, daughter of Hiroko Higuchi and Assemblymember Al Muratsuchi, made the official presentation of the first book on Monday at a special ceremony at the prime minister’s official residence. 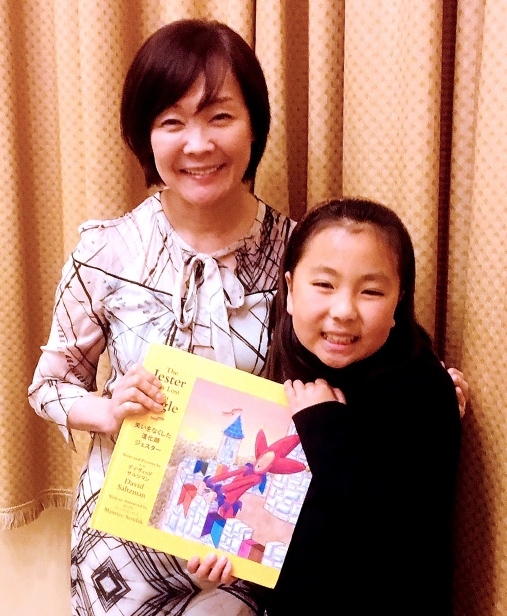 Also attending were Ayako Higuchi, Sophia’s grandmother and president of the Tokyo Global Rotary Club, and Sophia’s mother, volunteer project coordinator for the nonprofit Jester & Pharley Phund of Southern California, which publishes the book. “We are delighted to make this donation to provide emotional support, laughter and hope to these children,” said Ayako Higuchi. She and Kazuhito Iida, along with other members of the organization, are making the donation to the Red Cross Society in celebration of the fifth anniversary of the Tokyo Global Rotary Club. More than 120 people representing various Rotary Clubs in Tokyo attended the long-anticipated event at Tokyo’s International House of Japan. The New York Times best-seller was written and illustrated by the late South Bay resident David Saltzman. “The Jester” was his senior project at Yale University before his death from cancer in 1990. Also a graduate of Chadwick School in the South Bay, he wanted his book about laughter, self-empowerment, hope and joy shared with ill children everywhere. Esteemed translator Etsuko Kihara provided the translation for the new English/Japanese edition. Smiles all around accompany the donation of 5,000 copies of “The Jester Has Lost His Jingle/Warai wo Nakushita Dokeshi Jester” to the Red Cross Society of Japan on April 4. Flanking First Lady Akie Abe, center, on left are donors Kazuhiro Iida and Ayako Higuchi, president of the Tokyo Global Rotary Club, with U.S. Jester & Pharley Phund Volunteer Project Director Hiroko Higuchi and Red Cross Executive Hiroyuki Onoo. 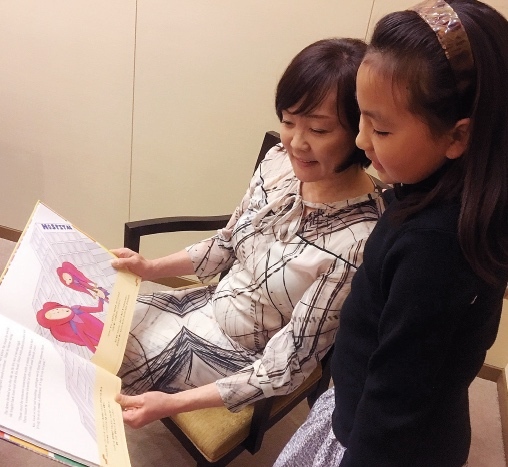 First Lady Akie Abe happily reads “The Jester Has Lost His Jingle/Warai wo Nakushita Dokeshi Jester” with Junior Jester Sophia Muratsuchi. Konoe and Higuchi met in Tokyo in 2014 to initiate the project. “The Jester,” which also is available in an English/Spanish edition, is the story of a jester and his helpmate Pharley who are banished from the castle when they fail to make the king and his court laugh. They embark on a worldwide quest to find laughter, only to discover it in the heart of a little girl in the hospital. Renowned author-artist Maurice Sendak (“Where the Wild Things Are”) wrote the afterword for the book. Copies of the new bilingual edition will be available at The Phund’s Booth 572 at the L.A. Times Festival of Books at USC on April 13 and 14.